Nutting?? Two social events were called Nutting Parties - an indoor party with a nut theme (see below for a 1907 description) and an outing to pick various types of nuts (1832 and 1902, below). Candy Pulls were another type of social party, which I described in two previous postings HERE . One great feature of this old rural merrymaking, is their going out in their very homeliest attire, and many there were who had worn the same nutting-dress for years. Old Royster’s leathershorts had been the heirloom of two generations, and when last we heard of them, were still able to bid defiance to brake or brier. What merry laughter have we heard ringing through those old woods, as some pretty maiden was uplifted by her sweetheart to reach the ripe cluster of nuts which hung on the topmost bough, where they had been browned by the sun, when, overbalancing himself, they came down among the soft wood-grass, to the great merriment of every beholder! Hazelnuts. When this clear yellow tint of the leaves is seen, the nuts are ripe, and never before—one shake at a branch, and down they come rattling out of their cups by scores— real 'brown sheelers' as they are called by country-people. Wood-nuts gathered at the end of September or the beginning of October, have the true 'nutty' flavour, which is never tasted if they are gathered before. There were no such nuts to be found anywhere as on these aged hazels, which, when ripe, we could shake out of their husks, or cups—nothing to be found in our planted Nutteries so firm and sweet as those grown in this wildwood…"
"Imagine a hundred children grouped in the dinginess of one of the city depots awaiting the train which is to take them to the nutting grounds. It is only a ten-mile ride, but the youngsters are as eager about it as though they were going a thousand. 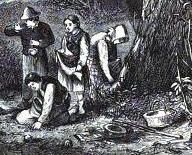 Some of them have never been nutting, and never have set eyes on a hickory nut tree, a hazel-nut bush or a walnut tree. They have seen the nuts themselves, for every town merchant has them for sale during the winter, but knowledge of the trees has never come to them. 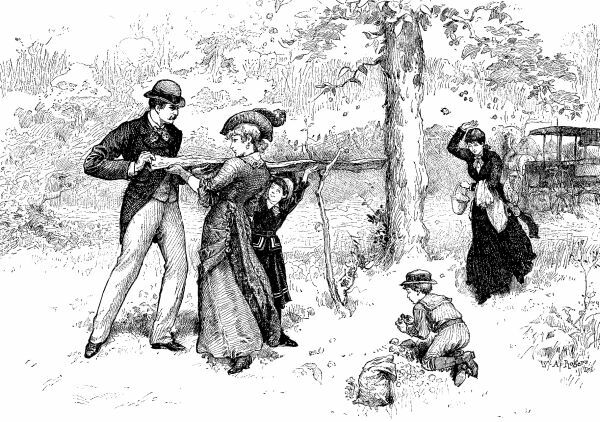 … the nutting party were told to arm themselves for the attack. Bags and baskets were supposed to be enough in the way of weapons, but some of the youngsters grabbed hoes, others had spades and others rakes. They were told that hazelnuts were to be found, and maybe butternuts, and perhaps hickory nuts, and that there were at least two walnut trees to be despoiled if anyone discovered them in the forest depths. Many a little tooth was injured that day by attempting to crack the nuts in the mouth before they were dry. 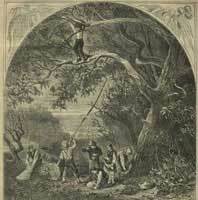 The nuts came into the city that evening to be dried on a tin-roofed building where despoilers could not get at them." "The refreshments may perfectly carry out the nutting idea:"
Peanut Sandwiches, Walnut Sandwiches, Chicken and Nut Salad, Salted Nuts, Bisque of Almonds or Burnt Almond Ice Cream, Cocoanut, Hickory Nut, or Pecan Cake, Nut Bonbons, Festinos, Cheese Balls with English Walnuts, Coffee. I found your post while googling "nut party," as I have a letter from 1902 that mentioned one and I hadn't heard the term before. The letter was written by a high-school-aged girl to her sister. Here's a quote: "Then Beulah was to have a nut party Friday but it snowed so she didn't have it until Sat. We had a sweet time. We had an adjective story had our fortunes told in walnuts and had a peanut hunt. Then George and Willie went over to the store and that "busted up" everything[.] We had refreshments of cake with walnuts on top, fudge and walnut creams Then we played P.O. George and Grace sat on the sofa. Florence and Sandy to-gether in a chair and (sweetest of all) Beulah in Douglas' lap, her head on his shoulder, his arm around her, and a sofa-pillow up so we couldn't see their faces. Wasn't that 'stunning?'" How wonderful!! Thanks for sharing.